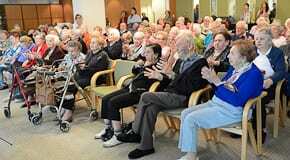 Members of the Sydney Symphony Orchestra have visited Sydney’s Montefiore Home at Randwick to perform for the residents. A spokesperson for the Home told J-Wire that she had never seen a turnout for an entertainment event like it in the history of the Home. 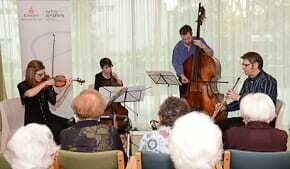 The Montefiore Home played host to the ensemble as part of the Making Music Being Well Week which is part of the national movement to promote music and its links with good health. 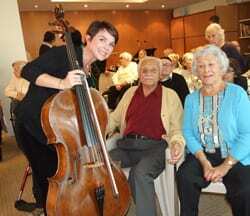 The spokesperson added: “We are lucky to have had such an amazing opportunity to showcase the talent of the Sydney Symphony to our Residents. Music therapy is one of the wide range of Allied health services that Montefiore provides, as it draws on the benefits of music to help maintain good health and wellbeing. Within Montefiore, regular Music Therapy sessions and regular events are held across all campuses for the enjoyment of our Residents. The Home runs such programs and events as part of its commitment to our Residents Quality of Life, designed to keep Residents active, involved and engaged in society. The Sydney Symphony musicians that performed at the Home were; David Campbell on Double Bass, Sandro Constantino on Viola, Fenella Gill on Cello, Jennifer Hoy on Violins and Alexandre Oguey on Cor Anglais. The program included; Michael Haydn Quartet in C Major for cor anglais, violin, cello and double bass 15’; Gioachino Rossini Duet in D Major for cello and double bass 13’ and Jean Françaix Quartet for cor anglais, violin, viola and cello 15’.